Maxillae U-024B: Partially edentulous maxilla with 1 socket, healed ridges, 1 sinus (thicker bone in the sinus) and soft tissue. 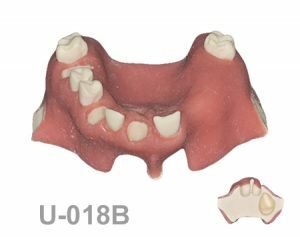 Maxillae U-023AB: Partially edentulous maxilla with extra bone to apply the 3A-2B rule. – Partially edentulous maxilla with soft tissue. – Perfect socket in left central. – Some missing teeth with healed ridges. 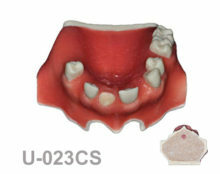 – Extra bone to apply the 3A-2B rule in the right lateral, to reduce bone before implant placement. -Ideal for suturing. 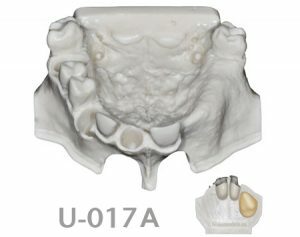 Maxillae U-023CS: Partially edentulous maxilla with 1 socket, healed ridges with cortical and cancellous bone and soft tissue. – Partially edentulous maxilla with soft tissue and without sinuses. – Perfect socket in left central. – Some missing teeth with healed ridges. – Its bone is with cortical and cancellous bone. – This model is ideal to place implants with different lengths and diameters. – Ideal for suturing. 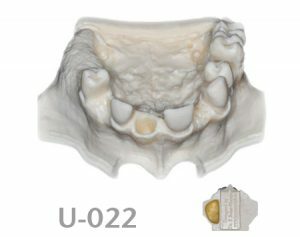 Maxillae U-022: Partially edentulous maxilla with 1 socket, healed ridges and 1 sinus. – Partially edentulous maxilla without soft tissue. – Perfect socket in left central. – Some missing teeth with healed ridges. – Model with left sinus and Schneider membrane. – This model is ideal to place implants with different lengths and diameters. -Ideal for sinus lifting. 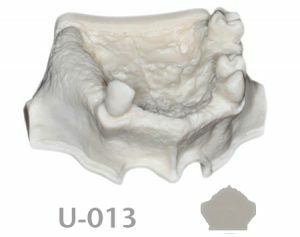 Maxillae U-021: Partially edentulous maxilla with 1 socket and healed ridges. – Partially edentulous maxilla without soft tissue. – Perfect socket in left central. -Some missing teeth with healed ridges. – This model is ideal to place implants with different lengths and diameters. 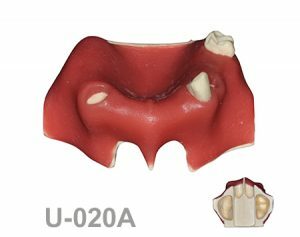 Maxillae U-020A: Partially edentulous maxilla with soft tissue, 2 sockets and both sinuses. – Partially edentulous maxilla with soft tissue. – 2 sockets (one with dehiscence). – 2 sinuses with Schneider membrane (one with septum). – Option for artery in the sinuses. – Thick palatal soft tissue to take connective tissue graft. – Ideal to place implants with different lengths and diameters. – Ideal for sinus lifting. – Ideal for suturing. 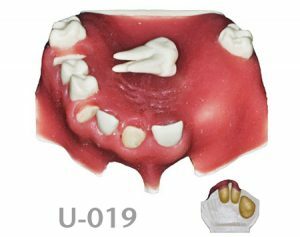 Maxillae U-019: Partially edentulous maxilla, 3 sockets, atrophic zone, 1 sinus and soft tissue. Removable first maxillary left molar. Maxillae U-018A: Partially edentulous maxilla, 3 sockets, atrophic zone, 1 sinus and soft tissue. 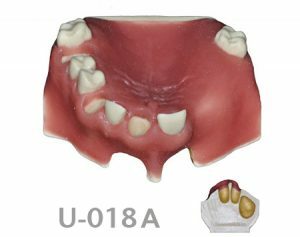 Maxillae U-018B: Partially edentulous maxilla, 3 sockets, atrophic zone, 1 sinus and soft tissue. Model for the skull. Maxillae U-017B: Partially edentulous maxilla, 3 sockets, atrophic zone and 1 sinus. Model for the skull. -Model with right sinus with Schneider membrane and floor of the nose. Maxillae U-017A: Partially edentulous maxilla, 3 sockets, atrophic zone and 1 sinus. – Partially edentulous maxilla without soft tissue. – 2 perfect socket in left maxillary central incisor and left first molar – 1 socket with dehiscence in maxillary left canine. – Severely atrophy in zone of right maxillary for bone graft. – This model is ideal to place implants with different lengths and diameters -Model with right sinus with Schneider membrane and floor of the nose. -Ideal for sinus lifting. 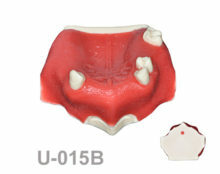 Maxillae U-016: Partially edentulous maxilla, anterior atrophy, soft tissue and sinuses. – Partially edentulous maxilla with soft tissue. – Presents atrophy in the anterior area. – Ideal for bone graft. 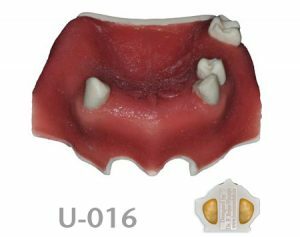 – This model is ideal to place implants with different lengths and diameters – Model with both sinuses and Schneider membrane. -Ideal for sinus lifting. – Ideal for suturing. – Partially edentulous maxilla with soft tissue. – Presents atrophy in the anterior area. – Thick palatal soft tissue to take connective tissue graft. – Ideal for bone graft or/and implant placement in posterior area with different lengths and diameters. – Model without sinuses. – Ideal for suturing. 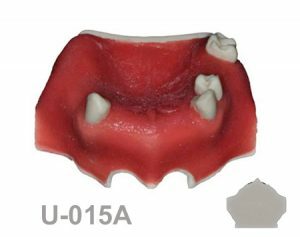 Maxillae U-015A: Partially edentulous maxilla with anterior atrophy and soft tissue. – Partially edentulous maxilla with soft tissue. – Presents atrophy in the anterior area – Ideal for bone graft or/and implant placement in posterior area with different lengths and diameters. – Model without sinuses. – Ideal for suturing. 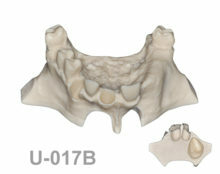 Maxillae U-014: Partially edentulous maxilla with anterior atrophy and sinuses. – Partially edentulous maxilla without soft tissue. – Presents atrophy in the anterior area. – Ideal for bone graft or/and implant placement in posterior area with different lengths and diameters. – Model with sinuses. -Ideal for sinus lifting. Maxillae U-013: Partially edentulous maxilla with anterior atrophy. – Partially edentulous maxilla without soft tissue. – Presents atrophy in the anterior area. – Ideal for bone graft or/and implant placement in posterior area with different lengths and diameters. – Model without sinuses.